As some of you may know, I recently returned from a wonderful vacation in Hawaii! What you might not know is that I technically took a trip there just before during a dinner at Roy's Chicago! What do I mean? Well, if you haven't dined at Roy's, the restaurant was started by Chef Roy Yamaguchi who combined his Japanese roots with native Hawaiian cuisine. The first Roy's opened in Honolulu, Hawaii in 1988 and there are now 20 locations. My first experience with Roy's was during a family trip to Hawaii growing up. It soon became a tradition to visit Roy's when in Hawaii, and once the Chicago location opened, we found ourselves dining there as well. I stopped into the Chicago location to sample their Eat Creative Prixe Fixe menu. The Hawaiian-inspired three-course menu features a starter, entree and dessert for $39.95 per person. 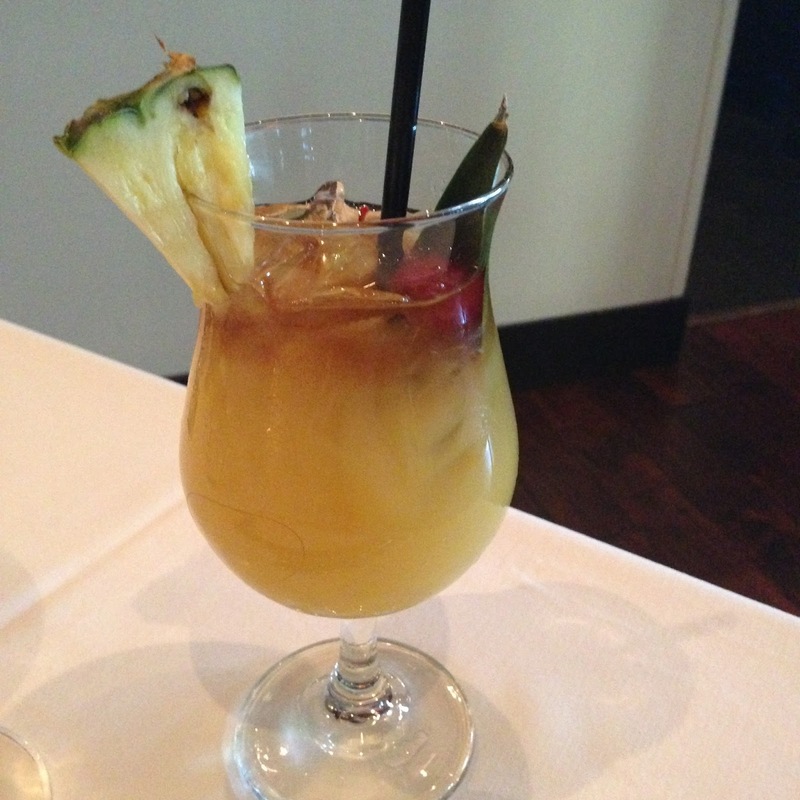 Plus you can also get a signature mai tai for less than $10! I had one, and it was delish! The starter and entree courses include your choice of one of two options, while there is one dessert option on the menu. The first course includes your choice of an heirloom tomato salad or shrimp shumai. 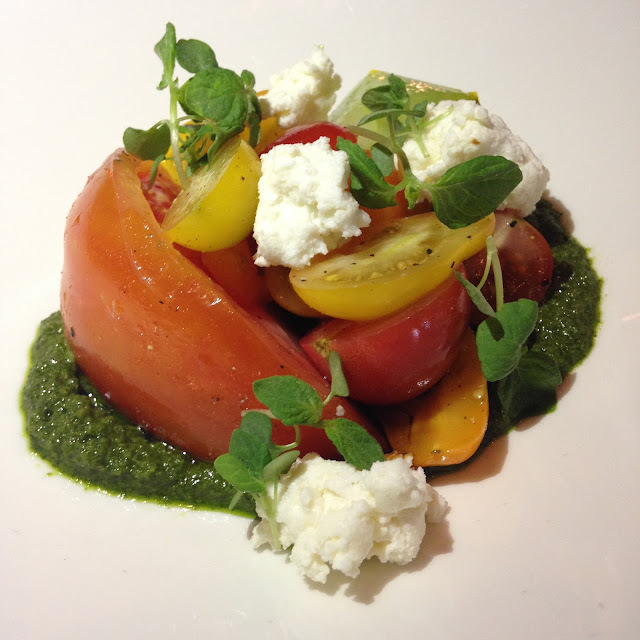 The tomato salad was topped with homemade ricotta which had a wonderful creamy texture. A macadamia nut pesto and shiso added an interesting twist as well. This was a colorful and refreshing option. The shrimp shumai was filled with Chinese cabbage and Kaiware sprouts and served with a pineapple shoyu vinaigrette (not pictured). For the entree course, we tried a pan-seared Hawaiian onaga with baby squash, shiso, tomato and a Vadouvan carrot puree. This dish was also very bright and colorful and I loved the crisp veggies. 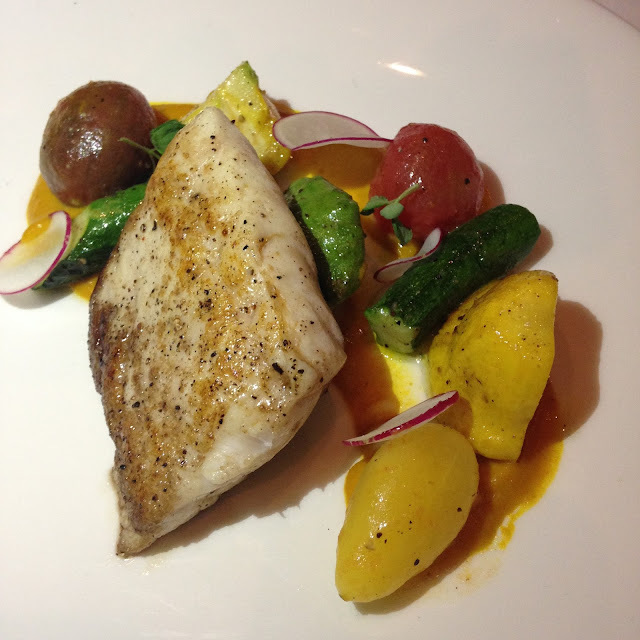 The fish was delicate and tender and made for a great carrier for that flavorful curry puree. 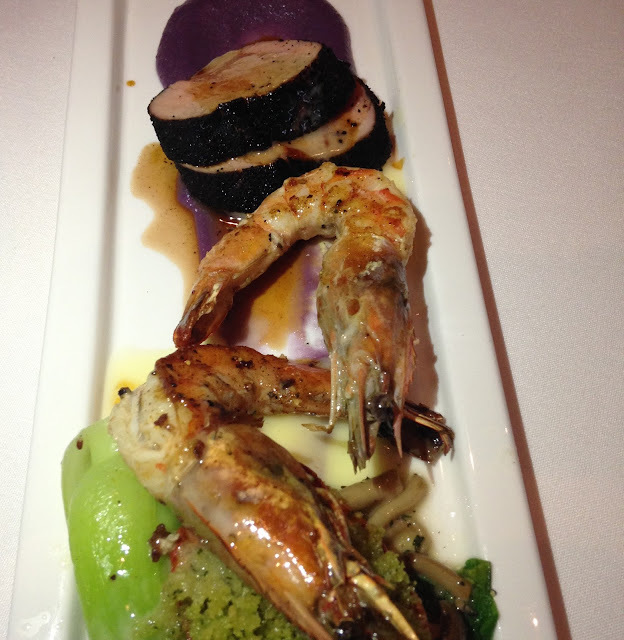 The other entree option on the Eat Creative menu is a combination of Kona coffee-crusted pork and Kauai prawns served with Okinawan coconut puree, Hoshimeji mushrooms, and bok choy. I loved the combination of coffee and pork...who knew those two items would pair so well? The prawns were huge and fresh and went well with the coconut puree. If you can't decide between meat and seafood for your entree, this dish has you covered! 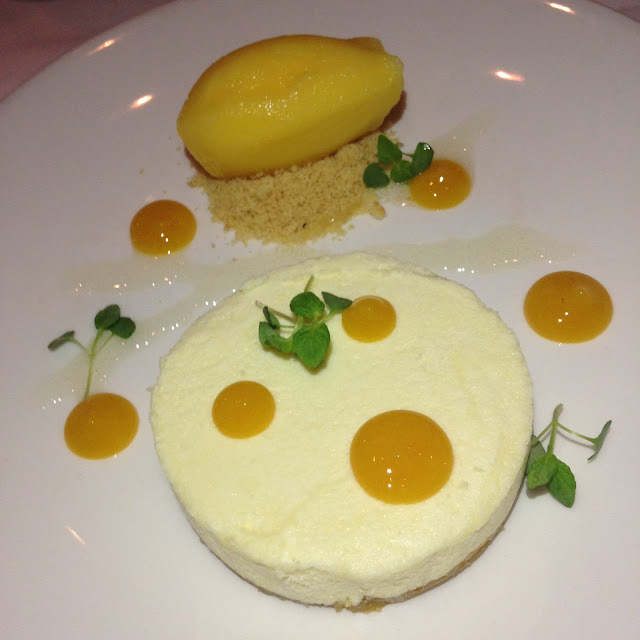 Lastly, we enjoyed dessert option, a white chocolate tart with passion fruit gel and sorbet. While I love Roy's signature chocolate souffle, I have to say, this dessert was so delicious and refreshing. After everything we ate in the starter and entree courses, it was nice to enjoy something on the lighter side. The sorbet was definitely my favorite part! Overall, I think Roy's offers a great value and you're certain to experience a different menu each time you visit. Chef Matthew does a wonderful job incorporating Hawaiian and Asian components into his cuisine, all while ensuring he's using fresh, seasonal ingredients! 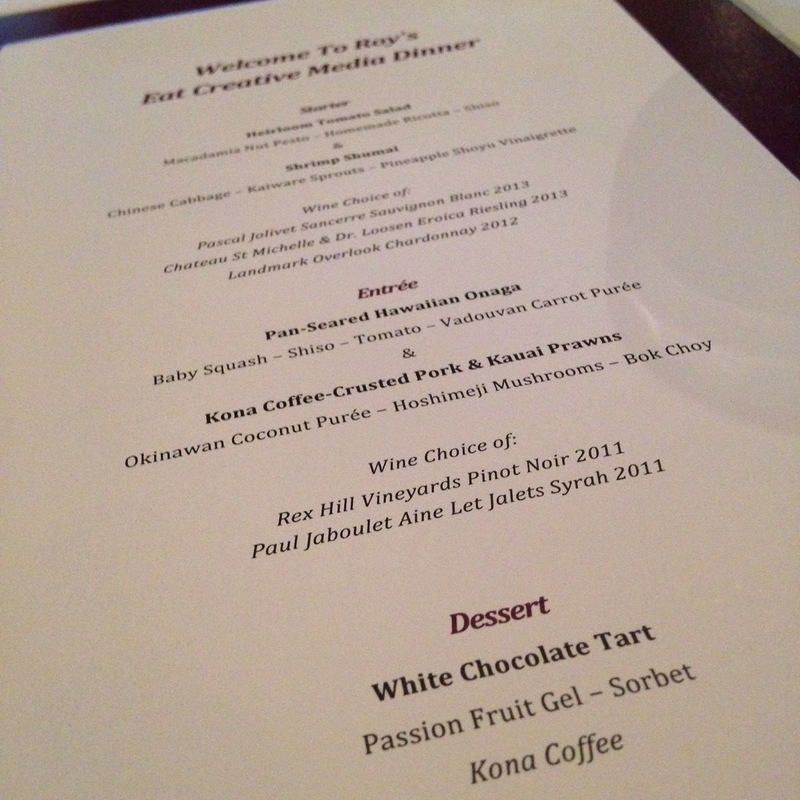 Note: my meal at Roy's was complimentary; however, the opinions expressed herein are my own.